12-11-2017 : Plus Two Supplementary Exam September 2017 Candidates can apply for Revaluation and Retotalling . The candidates requested scanned copies of answer sheets can download them from the website scan.tndge.in on 13-11-2017. Candidates can apply for revaluation and retotalling also from the same website. The two copies of the applications should be submitted at the CEO offices before 5pm of 17-11-2017. 31-10-2017 : Plus Two Supplementary Exam September - October 2017 Result to be published today (31st October 2017) at http://www.dge.tn.gov.in/ website. Tamilnadu Plus Two Result 2017 to be published at 10.00 AM today (12-05-2017). Students will receive their result in their mobile phones as SMS with in 10 minutes of the result publication. The School Education Department has decided not to publish Rankwise Student Details from this year Plus Two Result. Students also can check their result from Directorate of Government Examinations (DGE) Official Websites given below. 07-05-2017 : Plus Two March 2017 Result will be published on 12th May 2017- Director of Government Examinations informed. 21-04-2017 : Plus Two Paper Valuation works are going to be completed with in tomorrow (22-04-2017). The Answersheet valuation works were involved by 40000 teachers in 75 centers. Following this, mark sheet preparation and all related works are planned to be completed with in 5th May 2017. 11-04-2017 : Tamilnadu 12th / Plus Two Public Exam 2017 Paper Valuation Works are expected to be completed before 21st April 2017. 04-03-2017 : Plus Two Paper Valuation Works are to be started on 1st April 2017. It seems, all the paper valuation works are planned to be completed before 20th April 2017. 03-11-2016 : Plus Two Supplementary Exam September - October 2016 Result will be published today (03-11-2016) at 10.00AM. 23-08-2016 : Plus Two Supplementary Exam June, July 2016 Retotalling / Revaluation Result will be Published on 23-08-2016 www.tndge.in website. 05-08-2016 : Plus Two Supplementary Exam Copy of Answersheets can be downloaded from scan.tndge.in website. Students those who are willing to apply for plus two / 12th revaluation or re-totaling, you can apply from Chief Education Officer's offices from 9th August 2016 to 10th August 2016 (before 5pm) . 22-07-2016 : Plus Two Supplementary Exam June 2016 Result Published at www.dge.tn.nic.in. The supplementary examination candidates can download provisional marksheets from the website. Last date for applying retotalling and copy of answer sheets will be 27th July 2016. 27-06-2016 : What is the reason for Students studied in other states top in BE/MBBS Admissions of Tamilnadu ? 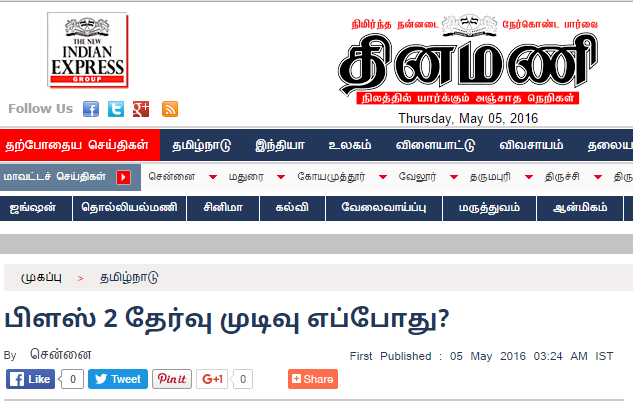 -Dinamani News Article. Educationalists Openion in Todays Dinamani Newspaper. Read Now. 18-06-2016 : Tamilnadu Plus Two Exam March 2016 - Original Mark Sheets to be issued from the respective schools from 20th June 2016 . 17-06-2016 : The Tamilnadu Plus Two Public Examination March 2016 was written by about 8.33 lakh candidates. Among them, 10,0751 candidates applied for copy of original answer sheets. 3344 persons applied for re-totaling and 3422 students applied for revaluation. The 12th public exam 2016 revaluation results will be published at scan.tndge.in website at 11.00 AM today (17th June 2016). 09-06-2016 : Plus Two July 2016 Exam Tatkal Application Dates Annonced. Last date to apply 11-06-2016. How to Apply in Tatkal Scheme? Candidates can apply from Chief Education Officer's Offices on 10.06.2016 and 11-06-2016 . For Tatkal candidates, the exam centre will be in Chennai only. Additional Fee - Rs.35/- . Temporary Mark Sheets of Tamilnadu Plus Two Exam March 2016 can be collected from the respective schools ( where the candidates studied) from 21st May 2016 onwards. The Tamilnadu Government has announced that the Plus Two Results will be published on 17th May 2016. The SSLC Result also expected to be published on 25th May 2016. 14-05-2016 : Tamilnadu Plus Two Exam March 2016 Temporary Mark Sheet will be issued from 19th May 2016. The result of Plus Two Exam 2016 in Tamilnadu will be published on 10.31 AM of 17th May 2016. Candidates can download their temporary mark sheet from www.dge.tn.nic.in website using their date of birth and plus two registration number. 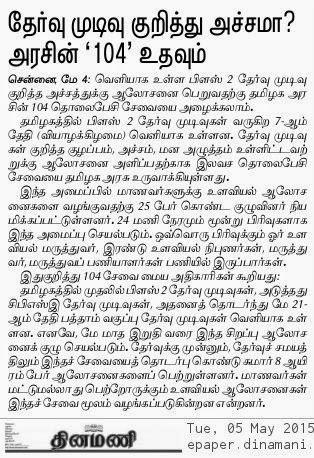 04-05-2016 : Plus Two Result Date - Latest news in Dinamani Newspaper Today. Dinamani Newspaper news today says that official notification about the Plus Two Result Date may be published today evening and the news also adds that the 12th Std public exam March 2016 result is expected to be published on 8th or 9th May 2016. This is also not a confirmed news. We have to wait for the official announcements from the TN Government regarding Plus Two Result Date. 03-05-2016 : When is the Plus Two 2016 Result Date? A latest news regarding Tamilnadu Plus Two Result May 2016 at Dinamalar Newspaper Today. Last year 12th std result in Tamilnadu was published on 7th May 2016. The newspaper says that plus two 2016 result is expected on 9th or 10th May 2016. And its is also not a confirmed news. 30-04-2016 : Plus Two Result Date Latest News in The Hindu Tamil Newspaper. Plus Two Exam 2016 in Tamilnadu was conducted from 14th March 2016 to 20th April 2016. Today's The Hindu Tamil Newspaper news conveys that the most awaited +2 public exam result is expected to be published on 5th May 2016 and the official information regarding the Tamil Nadu Plus Two Result will be communicated soon. The news article also adds that the last date for applying online for the Engineering Courses also expected to be on 12th May 2016. According to the newspaper article, the answer sheet valuation works for the Tamilnadu Plus Two Public Exam 2016 began on 14th March 2016 in 64 centres throughout Tamilnadu. The entire paper valuation works are expected to be completed today (20-04-2016). After completion of answer sheet valuation works, the marks details of the candidates will be uploaded in the computer through barcoding. After this process, compiling and validating the marks will be done at the Government Data Centre, Kotturpuram, Chennai. 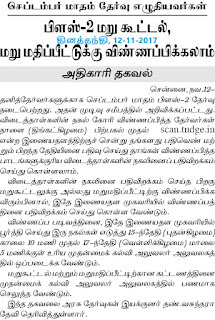 08-04-2016 : Tamilnadu Plus Two 2016 Exam Result may be published before 7th May 2016 - Latest News in Dinathanthi Newspaper Today. The 12th public exam in Tamilnadu was conducted from 4th March 2016 to 1st April 2016. About 8.82 lakh students through out Tamilnadu wrote the examination. The paper valuation works for the TN Plus Two public exam 2016 was started on 14th March 2016 in 68 centres accross the state. 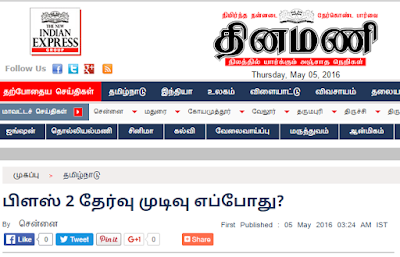 According to the Dailythanthi news dated 8th April 2016, the plus two 2016 result is expected to be published before 7th May 2016. 03-03-2016 : Plus Two Result Date Latest News in Tamil Hindu Newspaper : Due to the Tamilnadu Legislative Assembly Elections 2016, the Plus Two result may be published earlier to the TN Election Date. The 12th Standard Public Exam March 2016 was conducted from 4th March 2016 to 1st April 2016. There were about 3.91 lakhs male stdents and 4.47 lakh female students wrote the Plus Two Examination March 2016 . The Hindu news article tentatively says that the Plus Two Result date will be on 9th May 2016. 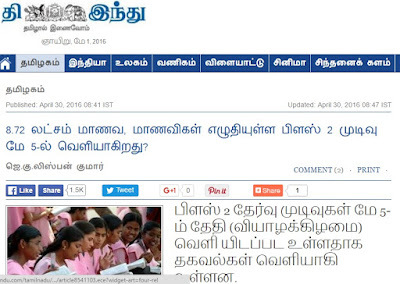 03-03-2016 : Tamilnadu Plus Two Public Exam March 2016 begins from tomorrow . About 9.25 Lakhs students from Tamilnadu and Puducheri write the examination. Be connected with us for all latest updates about TN Plus Two Exam 2016. www.tnpscportal.in wishes all the best to all 12th Std Students !. 23-02-2016 : Tamilnadu Plus Two Public Exam March 2016 - Private candidates who have applied in the Tatkal Scheme can now download their Hall Ticket from the TNDGE Website from 23.02.2016 to 25.02.2016. How to Download Hall Ticket ? (ii) Click on "HIGHER SECONDARY EXAM MARCH 2016 - PRIVATE CANDIDATE - TATKAL HALL TICKET PRINT OUT"
For Language Papers 30 Pages Ruled Sheets will be provided. Four Pages additional sheet only will be provided with the main sheet of the Plus Two Exam. 08-02-2016 : Plus Two Public Exam March 2016 Practical Exam Starts today. www.tnpscportal.in wishes the 12th practical examination candidates all the best. May GOD help you all to score your dream marks in the upcoming public examination too. 02-01-2016 :Tamilnadu Plus Two / 12 th March 2016 Tatkal Scheme application for private candidates will be done from 02-02-2016 to 04-02-2016 . Please visit Government Exam Service Centers near by your place. The Plus Two Tatkal applying candidates have to pay Special Tatkal Fee of Rs.1000/- . So bring sufficient money when you going to apply. All the best ! 29-01-2016 : Tamilnadu Plus Two / 12th March 2016 Private Candidates can download the Hall Tickets from 30.01.2016 to 01.02.2016 from the www.tndge.in website. To download hall ticket, click the link Higher Secondary Exam March 2016 - Private Candidates - Hall Ticket Print Out. To view 12th Public Exam March 2016 Time Table published in the newspapers dated 6th January 2016. 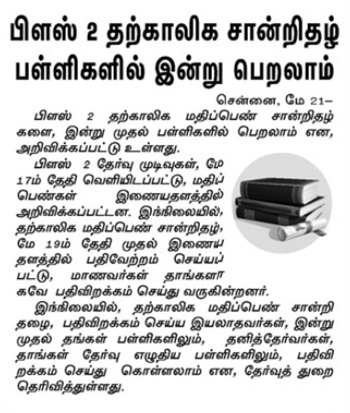 01-12-2015 : Tamilnadu Plus Two Exam March 2016 Register Numbers to be issued with in two weeks - Dinamani News. 28-11-2015 : TN Plus Two / 12th Public Exam March 2016 - Last date to apply is extended to 4th December 2015. Earlier, the TNDGE has announced the last date as 27-11-2015. Now the last date for applying through Government Exam Service Centres is extended to 04-12-2015. 26-11-2015 : Tamilnadu Plus Two / 12th Public Exam March 2016 Dates to be announced in the next week - Dinamalar newspaper news today. According to the news paper article, due to the Tamilnadu Assembly Elections 2016, the 12th Standard Public Exam March 2016 is expected to begin little earlier from 29th February 2015 and completed with in the month of March 2015. 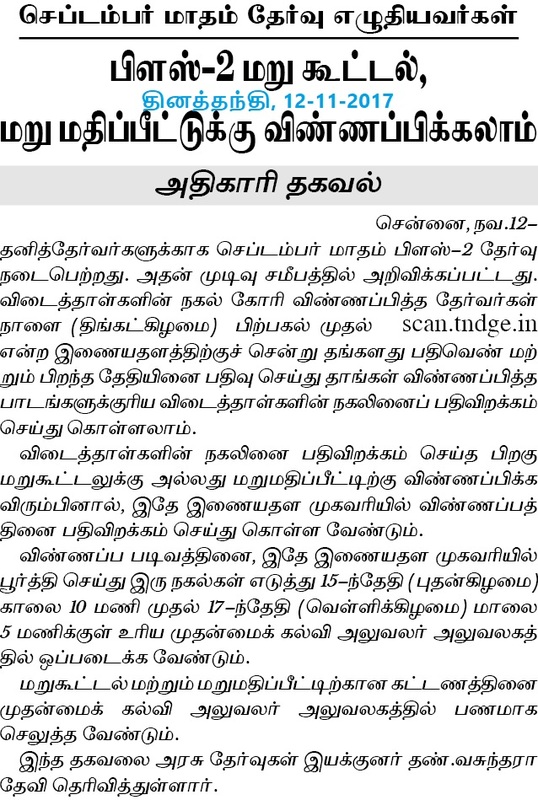 21-11-2015 : Tamilnadu Plus Two Supplementary / Private / Arrears Exam September - October 2015 candidates can now download the copy of answer sheets from the TNDGE Official website scan.tndge.in website. After downloading the copy of answer sheets, the candidates can apply for Retotalling / Revaluation using the application forms given in the scan.tndge.in website. 20-11-2015 : Plus Two Exam March 2016 Last Date to Apply is extended to 27th November 2015. The Tamil Nadu Director of Government Examinations (TNDGE) Mrs.Vasuntharadevi has published the notification regarding this. This postponement of last date is due to the severe rain of last 10 days. The Private / Arrears / Attempt Candidates can now apply online from the Government Examinations Service Centres near by them. Tha Directorate of Government Examinations (TNDGE) has notified that the Private Candidates can apply for the Plus Two Exam March 2016 from 16th November to 27th November 2015. The candidates are asked to apply online through Government Examinations Seervice Centres. 02-11-2015 : Tamilnadu Plus Two / 12th Supplementary / Private / Attempt / Arrears Exam September 2015 Result is published on 02-11-2015 . Candidates can download the provisional mark sheets for individuals using their Registration Number and Date of Birth from the TNDGE official website www.dge.tn.nic.in . To apply for 12th supplementary exam september 2015 retottaling and copy of answersheets, candidates can apply from 4-11-2015 to 6-11-2015 at the respective CEO offices. 16-09-2015 : Tamilnadu 12th / 10th Private Exam September, October 2015 - Candidates can download the Hall Tickets on 18th September 2015 from www.tndge.in website. 08-09-2015 : Tamilnadu Plus Two Private Exam / Supplementary Exam September, October 2015 - Candidates can now apply in Tatkal Scheme. Candidates should pay additional Rs.1000/- as special admission fee to apply in the Tatkal Scheme application. 20-08-2015 : Last Date to Apply Tamilnadu Plus Two Private Exam September - October 2015 is extended to 22nd August 2015. Previously the TNDGE has informed the last dates as 19-08-2015. Now the candidates can apply till 5PM of 22-08-2015. 11-08-2015 : Tamilnadu Plus Two Arear / Supplementary/ Private Exam September - October 2015 Notification Published. Candidates can apply from 13th August 2015 at the Government Exam Service Centres. 01-08-2015 : Tamilnadu Plus Two Supplementary Exam June 2015 - Copy of Answer sheets can be downloaded from the scan.tndge.in from today 10 AM. How to apply for Retotalling / Revaluation ? Download Application for Retotalling / Revaluation from the TNDGE website. Fill it and submit before 5,6 -08-2015 at CEO office. 17-07-2015 : Plus Two Supplementary Exam June 2015 Result to be Published Today (17-17-2015, Friday) at 12 Noon. 27-05-2015 : No Change in Schools Opening Date - All Schools in Tamilnadu will be opened on 1st June 2015 as per plan. -School Education Department Informed. How to Check your Plus Two Result 2015 ? Step 1: Login any one of the following website. The 12th Public Exam 2015 in Tamilnadu was attended by about 8.80 lakh students across the state . The Government has informed the list of official result publishing websites for publishing Tamilnadu Twelth Exam Result 2015 . The Directorate of Government Examinations (TNDGE) has notified that the Tamilnadu Plus Two Result 2015 will be published on 7-5-2015. 18-05-2015 : Candidates themselves can download the Mark Certificates from www.dge.tn.nic.in website after tamnilnadu 2015 plus two results. Tamilnadu Twelth Result 2015 Over All Exam Toppers, Subject wise Toppers details will be updated soon. Flash News !!! Tamilnadu Plus Two Exam 2015 Result Date Announced - The Director of Government Examinations has published the Result Date of Plus Two Public Exam March 2015. The result is expected to be published on 07-05-2015, 10.00 AM. If you fear about Plus Two Results in Tamilnadu of 7th May 2015, you may contact 104 from your mobile or landline for free counselling from the counselling experts. There is a 25 members team has been set for counselling the students. This counselling number will be working on 24/7 basis. News Courtesy : Dinathanthi, 23-04-2015. The Director of School Education has informed that the Primary, Middle , High Schools and Higher Secondary Schools are scheduled to be opened after holidays on 01-06-2015 . 05-04-2015: Answer Sheet Valuation for important papers to be completed before 14th April 2015. The 12th Std Public Exam 2015 in Tamilnadu was written about 8.56 lakhs students. The exams were conducted from 5th March 2015 to 31st March 2015 . Plus Two March 2015 Answer Sheets Valuation for 10 subjects starts today. The works are planned to be completed with in 14-04-2015 . The Tamilnadu 12th Exam 2015 result is expected in the first week of May 2015 . Tamilnadu 12th Public Exam begins today ( 05-3-15) . The government has announced helpline numbers to assist the candidates . The following are the helpline numbers. The 12th Public Exam March 2015 is going to be conducted through out Tamilnadu from 05-03-2015 to 31-03-2015 . The examination will be attended by 843064 students. This examination is conducted in 6256 schools. There are 42963 private candidates are appearing for this year 12th public Exam. In order to assist the students with exam fear and to provide them right counselling, the Government of Tamilnadu has set up facility through 104 call centre. The call centre will provide advises for not only students but also parents on Food Habits during exam days, health tips etc. Students or Parents can contact this 104 Helpline Number 24/7. There is a Psychotrist and Two Counsellors are present in the Call Centre to provide counselling. 30-01-2015 : Tamilnadu Plus Two / 12th March 2015 Tatkal Scheme Notification Published today. Read more. The Tamilnadu Directorate of School Education has published the Examination Time Table for the Plus Two Public Exam March 2015 . The Tamilnadu 12th Exams starts on 05-03-2015 and ends on 31-03-2015.